First Edition. Hardcover. Fine/Near Fine. Flat Signed w/ artwork! Signed on the title page and is author's signature only. Hardcover first edition / first printing. Fine book in fine jacket, not price clipped, Minimum scuffing and edge wear. No writing or marks. Comes with Certificate of Authenticity for author's signature. Your books ship to you with protective mylar jacket, bubble wrapped in cardboard box. 2003-03-04. New. Ships with Tracking Number! INTERNATIONAL WORLDWIDE Shipping available. Buy with confidence, excellent customer service! New York: William Morrow & Co, 2003. SIGNED by the AUTHOR on the Title page. Signature only First edition, First printing. Book is in Near Fine condition. Boards are clean, not bumped. Fore edges have a small amount of reading wear. Interior is clean and legible. Not remaindered. Dust Jacket is in Near Fine condition. Tiny bit of edge wear, tiny bit of crinkle. Not price clipped. Dust Jacket is covered by Mylar wrapper. Thanks and Enjoy. All-Ways well boxed, All-Ways fast service. Thanks.. Signed by Author. First Edition. Hard Cover. Near Fine/Near Fine. 2018-08-07. Good. Ships with Tracking Number! INTERNATIONAL WORLDWIDE Shipping available. May not contain Access Codes or Supplements. May be ex-library. Shipping & Handling by region. Buy with confidence, excellent customer service! New York: William Morrow, 2003. CE3 - A first edition hardcover book SIGNED by author in very good condition in very good dust jacket that is mylar protected. Book has some light stains on the page edges, dust jacket and book have some bumped corners, light discoloration and shelf wear. 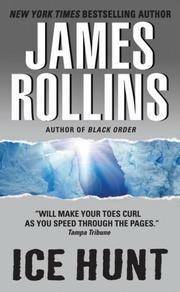 A masterful blending of science and adventure, suspense and explosive page-turning excitement, James Rollins's Ice Hunt is a novel that will chill readers to the bone, holding them in its icy grip from the first sentence to its final startling twist. 9.5"x6.5", 397 pages. Satisfaction Guaranteed.. Signed by Author. First Edition. Hard Cover. Very Good/Very Good. 8vo - over 7¾" - 9¾" tall. New York: MORROW, 2003. Book. N-Fine. Hardcover. First Edition/First Printing. A square solid tight clean carefully read copy, if at all. A very nice copy of the author's 5th book using this pseudonym. NOT an easy book to find. THIS COPY IS IN MY POSSESSION AND NORMALLY SHIPS NEXT DAY. This copy includes a picture that i snapped of James at the sihning event. James signed the book and included a small drawing as he usually does..
Scranton, PA, U.S.A.: HarperCollins Publishers, 2003. Book. Very Good. No Binding. Signed by Author(s). 1st Edition. A Very Good Copy - Signed By The Author On The Title Page. First Edition, First Printing. Book Is In Very Good Condition. Boards Are Clean, Not Bumped. Fore Edges Have A Small Amount Of Shelf Wear. Interior Is Clean And Legible. Not Remaindered. Dust Jacket Is In Very Good + Condition. Tiny Bit Of Edge Wear, Tiny Bit Of Crinkle. Not Price Clipped. Dust Jacket Is Covered By Mylar Wrapper. Thanks And Enjoy..
William Morrow. Hardcover. 0060521562 New Condition. . New. Harper. MASS MARKET PAPERBACK. 0060521600 New Condition. . New. HarperLuxe, 2011. Paperback. New. 9 x 6 cm. New York: William Morrow. Fine in Fine dust jacket. 2003. First Edition; First Printing. Hardcover. 9780060521561 . No Priority shipping. International orders may require additional postage. ; Signed on the title page by James Rollins and with a doodle. ; 9.31 X 6.36 X 1.34 inches; 416 pages; Signed by Author . New York: William Morrow. Fine in Fine dust jacket. 2003. First Edition; First Printing. Hardcover. 8vo; 394 pages; Signed by Rollins on the title page. ; Signed by Author . William Morrow & Company. Hardback. Fine/Fine. 1. 2003. Hardback. Fine. First Edition. First Print. Signature only by author on the title page and has author drawn doodle. Very collectible copy, excellent addition to your collection. Dust jacket is protected with a Mylar cover. Books are packed and shipped in boxes. Scranton, PA, U.S.A.: HarperCollins Publishers. Almost Like New, Very Little Shelf Wear On The Jacket Or Book, Binding Is Crisp And Pages Are Clean, "Buried Deep In The Earth's Polar Ice Cap Carved Into A Moving Island Of Ice Twice The Size Of The United States Is A Secret Place, The Site Of A Remarkable Abandoned Experiment That Could Have Frightening Ramification For The Planet." . Near Fine. Hardcover. Stated First Edition. 2003. 2003-03-04. Good. Ships with Tracking Number! INTERNATIONAL WORLDWIDE Shipping available. May not contain Access Codes or Supplements. May be ex-library. Shipping & Handling by region. Buy with confidence, excellent customer service! New York: William Morrow, 2003. Book. Very Good +. Hardcover. Signed by Author(s). First Edition/First Printing. A square solid tight carefully read copy. This copy has some light soil to the edges of the text block, a black felt tip mark to the bottom edge of the text block. The priced jacket has some light rubbing wear, lightish edge wear. THIS COPY IS IN MY POSSESSION AND WILL NORMALLY SHIP NEXT DAY. Signed by James with the drawing he usually adds. This copy includes a picture that I snapped at the signing event..
New York: William Morrow, 2003. Book. Fine. Hardcover. First Edition/ Second Printing. A square solid tight carefully read copy. This copy has just a hint of pagedge soil else fine. A very nice copy of the author's 5th book. NOT an easy book to find in any condition. THIS COPY IS IN MY POSSESSION AND WILL NORMALLY SHIP NEXT DAY. This copy includes a picture that I snapped of James at the signing event. He signed and included a small drawing as he usually does..
2010-04-03. Good. Ships with Tracking Number! INTERNATIONAL WORLDWIDE Shipping available. May not contain Access Codes or Supplements. May be ex-library. Shipping & Handling by region. Buy with confidence, excellent customer service! New York: William Morrow. Fine in Fine dust jacket. 2003. First Edition; First Printing. Hardcover. 9780060521561 . No Priority shipping. International orders may require additional postage. ; 9.31 X 6.36 X 1.34 inches; 416 pages . William Morrow. Hardcover. 0060521562 Like New Condition. . Fine. Harper. MASS MARKET PAPERBACK. 0060521600 Like New Condition. . Fine. New York: William Morrow, 2003. Book. Very Good +. Hardcover. Signed by Author(s). First Edition/First Printing. A square solid tight carefully read copy. This copy has light soil to the edges of the text block, several small light see through type stains, slight spine lean. A pretty nice copy of the author's 5th book. NOT an easy book to find in any condition. THIS COPY IS IN MY POSSESSION AND WILL NORMALLY SHIP NEXT DAY. This copy includes a picture that I snapped of James at the signing event. He signed and included a small drawing as he usually does..
William Morrow. Used - Very Good. Ships from the UK. Great condition for a used book! Minimal wear. 100% Money Back Guarantee. Your purchase also supports literacy charities. William Morrow. Hardcover. 0060521562 First Print. First edition. Signed by the author on the title page. NOT inscribed, clipped or otherwise marked. Dust jacket in protective cover and shipped in a box. Complete # line 10987654321. . Fine. 2003. 1st Edition. Harper, 2004-07-01. Mass Market Paperback. Very Good. Nice looking book, has minor edge wear. William Morrow, 2003. US First Edition, First Printing Hardcover. Fine/Fine. Signed on a full-color bookplate loosely laid in. SIGNED. Protected in clear Mylar cover. Bubble wrapped and shipped in a box. We do not stock or sell ex-library or Book Club editions. William Morrow. Used - Good. Ships from the UK. Former Library book. Shows some signs of wear, and may have some markings on the inside. William Morrow. Very Good+ in Very Good dust jacket. 2003. First Edition; First Printing. Hardcover. 0060521562 . Remainder mark on bottom; 9.31 X 6.36 X 1.34 inches . (New York): Avon Books, 2004. 1/3/2011. Very Good. First edition thus. Mass market paperback. Very good plus with creasing to spine. HARPER. New. 7.58 x 4.25 cm. William Morrow, 2003. 1st/2nd. Hardcover. VG+/VG+. No marks inside or out, almost like new. Clean hardcover with tight square binding and one nudged corner. Unclipped dustjacket with very little wear and no tears. NY: William Morrow, 2003. 2nd printing of the First Edition. - - Wrapped, boxed and promptly shipped with tracking provided. William Morrow, July 2003. US First Edition, First Printing Hardcover. Fine/Fine. Signed on the title page with a doodle. TINY PUSH ON TOP TWO CORNERS SIGNED. Protected in clear Mylar cover. Bubble wrapped and shipped in a box. We do not stock or sell ex-library or Book Club editions. Harper, 2010-04-27. Reprint. Mass Market Paperback. Used:Good. Unknown. PAPERBACK. 0752883828 Brand New ,Original Book , Direct from Source , Express 5-8 Business days worldwide Delivery. . New. Avon, 2004. Flatsigned by author on title page, with sketch of iceberg.. Signed by Author. 1st Printing. Mass Market Paperback. Very Good/Reading creases on spine. HarperLuxe. PAPERBACK. 006206651X Very Good Condition. Has some wear. Five star seller - Buy with confidence! . Very Good. William Morrow. Used - Very Good. Ships from Reno, NV. Former Library book. Great condition for a used book! Minimal wear. 100% Money Back Guarantee. Shipped to over one million happy customers. Your purchase benefits world literacy!